Santisimo: Amelia sings with Puntilla and Barreto on killer CD. Amelia Pedroso passed to the ancestors on 5/24/00 and was buried on 5/25/00. She died as a result of a cancer which was poorly treated at its inception in '98 as Cuba does not have the medicines and equipment it needs, thanks to the genocidal blockade. As a result she had a relapse while traveling and had to return to Cuba, cutting short her tour. Amelia Pedroso was an icon of AfroCuban culture: a highly respected percussionist, singer, teacher, and performer of Afro-Cuban ritual music. For more than 20 years she taught and performed as a singer and master percussionist on stage, television, and radio as well as for recordings. She was an acknowledged expert in the texts of Yoruba ritual music in Cuba. In 1985 Amelia joined Clave y Guaguanco. Their album, "Songs & Dances" (Green Linnet Records), was released in the US in the fall of '94. Amelia has also performed with Danza Nacional de Cuba and Danza Contemporanea. In January '94, Amelia toured the US with Lazaro Ros. They performed concerts and workshops at schools and universities across the country, appeared in major clubs and concert halls, conducted master classes in instrumental, vocal, and dance techniques, and were guest performers at numerous ritual ceremonies in Cuban-American communities. In the summer of '94, Amelia was an instructor at AFROCUBANISMO, a 10 day international seminar and festival at the Banff Center in Canada. In 1995, Amelia toured the US with her all-women vocal and percussion group, Ibbu Okun. She toured solo in the UK in 1999 and again in the US, also in 1999. Her last tour of the US was in spring of 2000, and it was cut short prematurely due to her worsening health. Amelia sat at the heart of a strong network of AfroCuban women, and we expect to hear a lot more from them! It is with great sorrow that I inform you that Amelia Pedroso, Olomide, has passed into spirit. Amelia died on May 24th, from lung cancer. Amelia was greatly loved and respected by many in Cuba, as well as internationally. She will remain one of the most revered singers of Afro-Cuban religious, and folkloric, music. Amelia was initiated into Ocha De Regla (Lucumi) at the age of three, and was a priest for Yemaya for over 50 years. She was destined to become a singer, and in her early years thought that she would become a singer of boleros. However, at the age of twenty, she became a serious student of Lucumi religion, music, dance and language. She held a profound and widely respected knowledge of the many aspects of her culture and of the Yoruban language. When asked what was her main influence for her vast knowledge of religious songs, she replied that she had learned the songs by attending and singing toques (ceremonies) almost every day for the last thirty-two years. Amelia was also a respected percussionist. 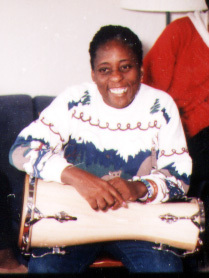 She was the creator and leader of the group, Ibbu Okun, which features an all-female Bata drum battery. Amelia was among the first Cuban women to publicly play Bata drums, and was a pioneer and courageous leader in the movement towards the acceptance of women percussionists in Cuba, in the US, and in Europe. Amelia's devotion to her culture and religion was inspiring. She was brillant, courageous, humble, humorous, loving, and always giving to all. Amelia, you will be forever missed. Amelia Pedroso died from lung cancer in her home in Havana, Cuba on Wednesday, May 24th, 2000. She was a trailblazer in womens drumming, a renowned akpon and Santera. Her friendship, generosity, humor and warrior spirit are deeply missed. She was a spiritual leader, teacher, mentor and friend to many. Join us to commemorate Amelia Pedroso. If you can, bring a dish for the potluck reception following the service. Please bring videos and photos to share during this time. Contributions for Amelias family in Cuba are welcome. Amelia was in Northern California from March 4 through the third week in May. She taught classes in Dilogun, song, conga drum, and bata. See her Bay Area schedule and contact info. She was in Philadelphia from March 19-27 for classes and two performances. See her Philadelphia schedule and contact info. thursday nights -- song classes from 8:00 - 9:15. Please e-mail cbrandydrum@earthlink.net for more information or to schedule other gigs. 1. Amelia will appear in a concert with NY- & Philly-based women's bata group Cambio Libre. Also featured Pedro Domech (dancer), formerly with the Conjunto Folklórico Nacional, as well as other guest artists from NY & Philadelphia. Sunday March 19, 7:30 pm, Rock Hall on Temple University Campus (on Broad St. north of Cecil B. Moore Ave., across the street from the Apollo of Temple). Free of charge & open to the public. 2. Open House for Women Drummers with Amelia Pedroso as guest of honor. Light refreshments will be served and a love offering (small donation for Amelia) is requested. Tuesday, March 21, 6:30-8:30 pm at the home of Nana Korantemaa Ayeboafo, 1730 N. 27th St. between Cecil B. Moore and Montgomery. This event begins Nana's class series for women drummers. 3. Song Lecture-Demonstration & Workshop, featuring Peache Jarman, John Wilkie, & Kenneth Fauntleroy on batá drums. Saturday March 25, 4:30-6 pm at AMLA (Asociación de Músicos Latino-Americanos), on 6th St. between Lehigh & Somerset in North Philadelphia. $10. 4. In conjunction with a current Cuban art exhibit, "Hidden Images," co-sponsored by several local groups, Amelia will perform with Cambio Libre at Brandywine Workshop, Sunday March 26, 3-5:30 pm. 730 S. Broad St. (Broad & Fitzwater) in South Philadelphia. Free admission. Amelia is available for private and small group classes, and private dilogun consultations, March 20-27 in Philadelphia. If anyone is interested in setting up gigs in NY, contact Julie Carson at jcarlson@urbanjustice.org or 212-696-8524.
International recording artist Amelia Pedroso will join The Mambo Queens for an unforgettable evening of AfroCuban music and dance at La Rumba Restaurant in Portland on Friday, July 30th. Also performing with the female percussion will be Isolina Romero, a member of Pedroso's own Ibbu Okun, a women's performing and recording ensemble based in Havana, Cuba. Aficionados of AfroCuban music will remember Pedroso's first trip to Portland in 1994 when she performed with the famous Lazaro Ros at Club Key Largo and accompanied master dance classes at Portland State University. 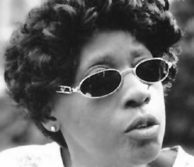 Pedroso broke ground into a field formerly denied to women, as the first woman to receive international recognition as a drummer of AfroCuban ritual music. She has also stunned listeners with her powerful singing voice on numerous recordings including "Santisimo" with Puntilla and "Ilu Aña" with Regino Jimenez. Pedroso and Romero will play and sing with The Mambo Queens, a popular local group who last week entranced an audience of 800 at the Tualatin Commons with their lively show of AfroCuban rhythms. The eleven-member female percussion and singing group, headed by Cuban-born Virginia Lopez, includes an international cast from Venezuela, Puerto Rico, Panama, and the United States, and is enhanced by five guest dancers including Habiba Addo from Ghana. The repertory includes sacred music from the Yoruba tradition rendered on the bata drums, AfroCuban rumbas, a lively comparsa that invites the audience to join in the dancing, and music from the Congolese tradition in Cuba. The show begins Fri July 30th at 7 p.m. at La Rumba Restaurant located at 130 NW Third and Davis. Admission $5-15 Limited seating. Call 238-2465 for info. 1. Song class from 10:30a.m. to 12 Noon. Call 238-2465 in Portland to register. take the L to Bedford Ave. Location of classes will be given at registration. The Catskill Mountain Womyn's World Drum and Percussion Happen¹n , August 19-22, will run from THURSDAY 3pm through SUNDAY 3pm at Elat Chayyim (Tree of Life) Center for Healing and Renewal located in Accord, New York. Elat Chayyim is a beautiful and comfortable retreat facility with full view of the mountains. "The Happen'n" is a women and girls only multi-cultural gathering. We expect to welcome 200 women to experience the uplifting and inspiring presentations of our very talented staff of teachers. Explore rhythmic technique and musical styles of the Djembe, Conga, Surdo, Frame Drum, Steel Drum, Shekere, Taiko and Stick Drumming. Develop a deeper sense of the traditional styles of West African, Brazilian, Afro-Caribbean, Native American, Japanese, and other cultural rhythms. Explore Deep Listening, Movement Meditation, Dance, Improvisation, Instrument Building, and Women's Drumming Traditions. Other Happen¹n features for '99 include a Blessing of the Drum Ceremony based on the traditions of the Candomble, a Purification Lodge led by Mohawk teacher Rainbow Weaver, the Marketplace, Exhibits and Gallery, our wildly popular Saturday Night Showcase (start working on your routines now! ), and lots of other surprises. All levels and percussive instruments are welcome. Scholarship Fund : You can make a tax deductible contribution to help cover the cost of participation of low income and Elder women. A limited number of scholarships / partial assistance grants are available to individuals who show financial need. If you are interested in applying for Scholarship assistance, send in the Registration form with a letter of request for a Scholarship application by May l5th. The per-woman fee includes all workshops, showcases, activities and use ofrecreational facilities, 3 vegetarian/Kosher meals daily, indoor or outdoor accommodations, pool, and hot tub. Accommodations do not apply to Day Rates or Commuter Rates. Cancellations will be charged $50.00 before August 1st. After August 1st, deposits are not refundable unless we can fill your room. please make copies for each woman, and send forms together with payments. Drum Central is dedicated to the advancement of women's participation inthe ancient and sacred rite of drumming. We support the expression of this tradition in innovative, diverse and unifying ways, as well as the creation of a personal and community based art form, inclusive to women all around the world. The Catskill Mountain Womyn's World Drum & Percussion Happen'n is our initial visionary action. We have assembled some of the most effective women teachers/musicians and visionaries to create a diverse cultural program of world drumming and percussion styles from the sacred to the secular. By providing a creative environment, women will learn the skills needed to form similar local "Happen'ns", drum councils, healing circles and other events in their own communities. The overall focus of Drum Central is to further the cultural evolution of a women's drumming tradition in the United States/North America. Amelia is due here on Fri 19th March. The first thing is a Fiesta de Bata in London. Next there's a weekend of performances, workshops and a Bembe in Manchester. Finally there's another performance of Orisha song and dance in London before Amelia returns to Cuba on the 31st. The CD <Lotz Of Music In Havana - Blues For Yemayá> is released! - The music involves a fusion of religious Afro-Cuban folklore music with European Jazz. - Recorded in April 1997 at the ICAIC studio in Havana, Cuba! - The jazzy interpretations of the songs of praise to the African Yoruba gods of the Cuban Santería religion provide a different look at Latin Music. - The 2CD box -Le Coq Rouge / Lotz Of Music Meets Bata Drums- already is very successful. The result are performances at festivals like the Percuba Festival in Havana and the North Sea Jazz Festival at the Hague, The Netherlands. - Radio stations, from Australia to Miami, still give enthusiastic attention to <Le Coq Rouge> . (In June <Le Coq Rouge> no.1 on WEFT, Illinois!) Here the successor!